The owner of a golf club in Co Clare wants to pay a visit to Ireland in the next four years. Who are we to object? Whether US President Donald J Trump invited himself or he was invited, he says he wants to come here during his presidency. Exactly how long his presidency will last is anyone's guess. Not too many inside the beltway in Washington DC expect him to stick the full four years. His first 50 days in office have certainly proven to be quite the rollercoaster. Anyway, Mr Trump and Taoiseach Enda Kenny got along swimmingly yesterday. Mr Kenny became the first non-Eurosceptic EU leader to meet Mr Trump since his inauguration in late January. German Chancellor Angela Merkel was due to get there first but the blizzard kept her away. As expected, Mr Kenny sat, gave the paw, rolled over and had his tummy rubbed in the White House. Mr Trump declared the Taoiseach was "my new friend, a great guy". And he said Ireland and America could do business under his administration. As their bromance blossomed, in a speech on Capitol Hill, Mr Kenny jokingly mocked the US president for sticking to his pre-prepared script. Mr Kenny said Mr Trump "will have the prayers and support of the Irish people". The only moment of dissent was when Mr Kenny appeared to press Mr Trump - quite gently - on his immigration clampdowns. The Taoiseach pleaded with Mr Trump to find a pathway to legality for the undocumented Irish. "We want it sorted," Mr Kenny said. The Taoiseach said there were millions who wanted to make America great. It was hardly a diplomatic incident. 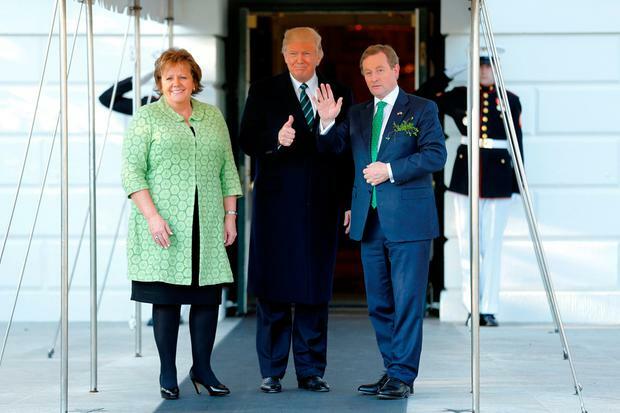 But when the pair met for the first time at the White House, the US president confirmed he will visit Ireland during the course of his presidency. Mr Trump said he "loves" Ireland as he sat in the Oval Office with the Taoiseach. And he confirmed he "absolutely" intends to visit Ireland. "I really love Ireland. I'll be there for sure," he said. Now there's a hospital pass for Mr Kenny's successor. Even though Mr Kenny is on his way out the door, he did extend a warm invitation to visit our shores. Mr Kenny says he raised Northern Ireland, Brexit and the issue of the undocumented Irish in his talks. The Taoiseach and Mr Trump did discuss the expected impact on the country of the potential restoration of the Border with Northern Ireland after Britain departs from the European Union. Mr Kenny was right to go to the White House. He was right to meet with Mr Trump. But any suggestion that he would express the discomfort of the Irish people about the new US president's rhetoric were well wide of the mark. When exactly Mr Trump's visit will happen is uncertain. What's clear is the Government will extend a Céad Míle Fáilte to him.